After my 105 pound weight loss, I started this blog to inspire and motivate others to live a healthy lifestyle! Hello Everyone! Its time for WHAT I ATE WEDNESDAY! I hope you all enjoyed the post on HIIT! I felt like it was something really important that needed to be shared. I love finding new ways to live a healthy lifestyle..and when I do…I will tell you all! My week has been really crazy. I am starting to think that school social work is not what I want to do with my life. It is really confusing and scary when you don’t know exactly what is going to happen and exactly where you are going to end up! I truly believe my calling in life is to help overweight kids, teens, and adults. I hope that God opens up doors for me and leads me in the right direction. It is all in his hands! So….lets get started with what I ate on Wednesday! Breakfast: I slept in a little too late, so breakfast had to be quick! I had a new granola bar I found in the store and it was so good! It actually kept me full until lunch. Now, I typically don’t like to have processed food in the mornings, but I have to leave extremely early for my internship and its sometime necessary! The ingredient list wasn’t long at all, which helps! Paired it with a banana! Lunch: I got creative with my lunch! 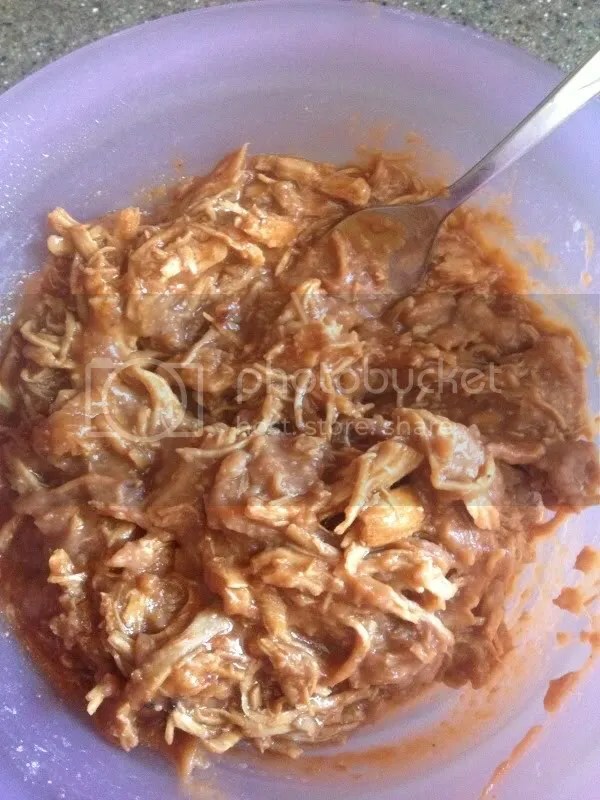 I mixed a can of light chunk tuna packed in water with 1/2 cup of fat free refried beans with 1/4 cup fat free cheddar and salsa! Microwaved it for about 1 minute! It was so good! Packed with protein so it kept me so full! 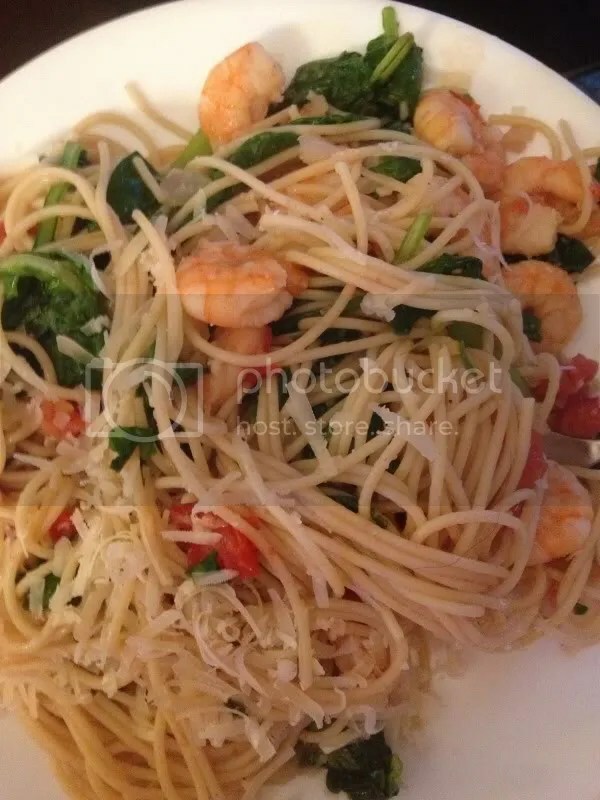 Dinner: We had shrimp in our house, so I went online and found a shrimp scampi recipe! It was from Eat Better America! It was so good! Basically it was whole wheat pasta, olive oil, garlic, spinach, shrimp, and tomatoes! I absolutely loved it! Shrimp is packed with protein and is so good for you! Snack: My snack was simple! 1 container of Yoplait Greek Yogurt with 1/5 ounce of peanuts! I used the strawberry fruit on the bottom yogurt so it tasted like peanut butter and jelly! So good! 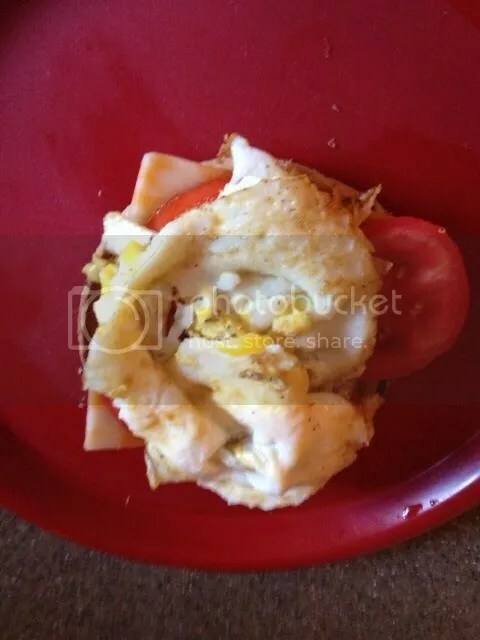 Breakfast: 1/2 of an Arnold 100% whole wheat sandwich thin toasted…with an egg fried up (cooking spray in pan;break yolk)…with a slice of reduced fat cheese and tomatoes! I always like to pair carbs and protein together for breakfast! It helps to give me the energy I need and it keeps me full all day long! 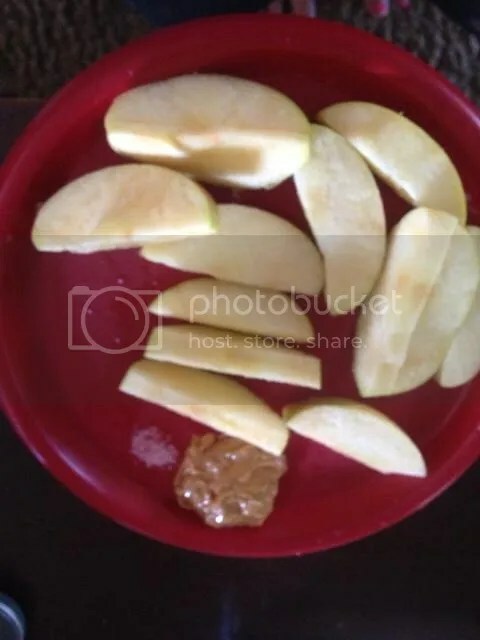 Snack: I needed a quick and easy snack today….I was really busy with running errands….So, I sliced up a Fuji apple and dipped the slices into 1 TBSP natural peanut butter. Such a treat!! Lunch: Lunch was quick and easy today! 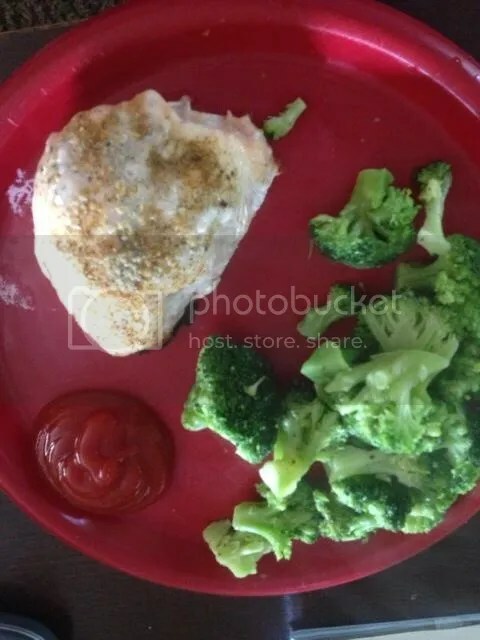 Chicken breast baked in the oven with a little bit of Cajun chicken seasoning. A side of broccoli. and of course a little bit of ketchup! I LOVE ketchup and have to watch how much I eat. But, I will never give it up! I tried not eating it for a month and ended up gaining weight because I would pick at more food because I was missing having it! Crazy, I know…but having it works best for me! All in moderation! Dinner: I was meeting an old Weight Watcher friend tonight for dinner at Panera Bread. You have to be careful there! A lot of the things on the menu are TERRIBLE for you!! However, they have a HIDDEN menu with AMAZING options! Tonight I had the Power Mediterranean chicken salad. 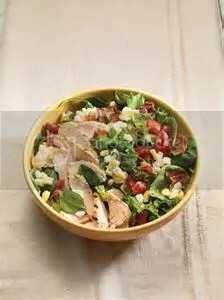 It has spinach, lettuce, grilled chicken, tomatoes, and a hard boiled egg. Dressing was olive oil and lemon juice on the side! So good and it felt like I was eating something bad! 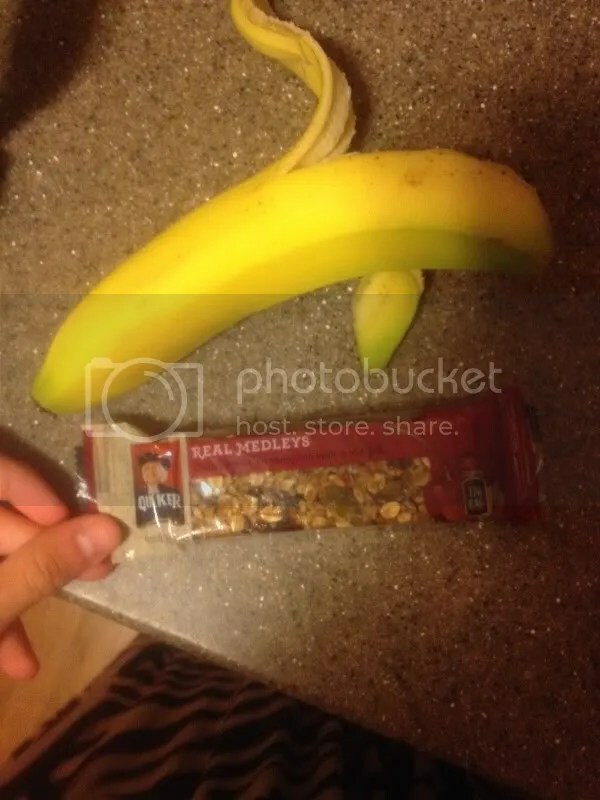 Snack: I LOVE to have a snack at night after dinner. It is something I will always do! Now, when I was overweight the portion would be HUGE! Almost 3 bowels of cereal. Now, I make sure I measure everything out! I had a good amount of points left over tonight so I was able to have a higher point snack. 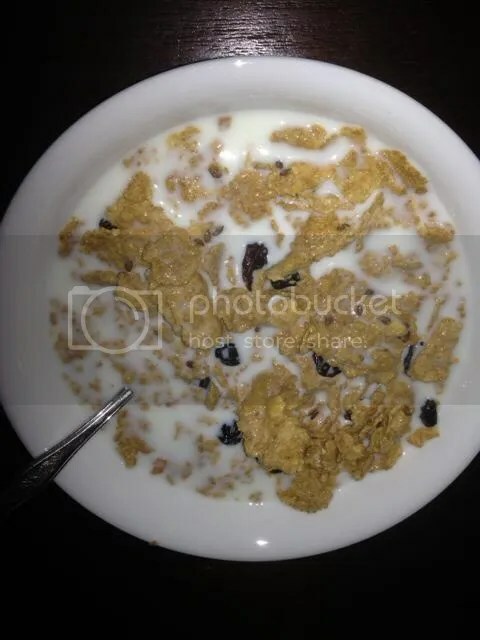 I had 1 cup of Raisin Bran with Flax seeds and 1 cup of skim milk! I hope this gave you some insight into what my days look like! typically its breakfast, lunch, dinner, and two snacks! Sometimes I can fit in 3 snacks! I track my food by using Weight Watchers points plus values. Everyone has a different points plus value depending on height, weight, age, and gender. What were some of the things you guys ate or tried today that you really enjoy having?! -God bless and live healthy! Finally, I can say I have my bachelors degree in Social Work! This is the start of big things!